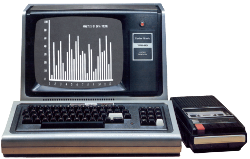 Benj Edwards’ PC Magazine article, a mini TRS-80 slideshow, Golden Age of TRS-80: A Look Back At RadioShack Computers contains highlights of the TRS-80 era. For trivia bonus points, before clicking through, can you guess which machine is named “The Micro Executive Workstation (TM)”? Unfortunately, the caption says only “Sam Rosen Elementary School/Fort Worth Independent School District”. A search for Computer Charlie brings up some worksheets from TLS books, but beyond that, nothing. To my eye, the Computer Charlie graphic looks very official, as if this were Radio Shack software, but given the free-wheeling nature of the time, that doesn’t mean much.